Lathe machines are generally used for machining cylindrical nature of general work. In addition, it is possible to provide special enhancement to the capability of the machine. Attachments are used on centre lathe to increase production and efficiency and widen its scope of use for such works which are normally not carried out on this machine. 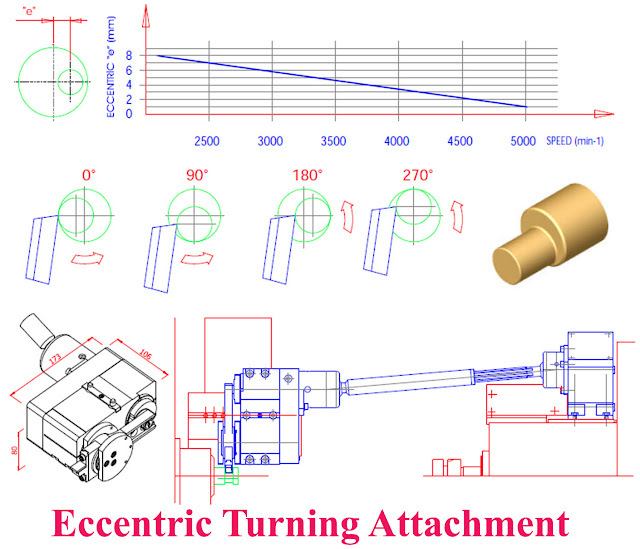 The principle of turning taper by a taper attachment is to guide the tool in a straight path set at an angle to the axis of rotation of the workpiece. The work is being revolved between centres or by a chuck aligned to the lathe axis. 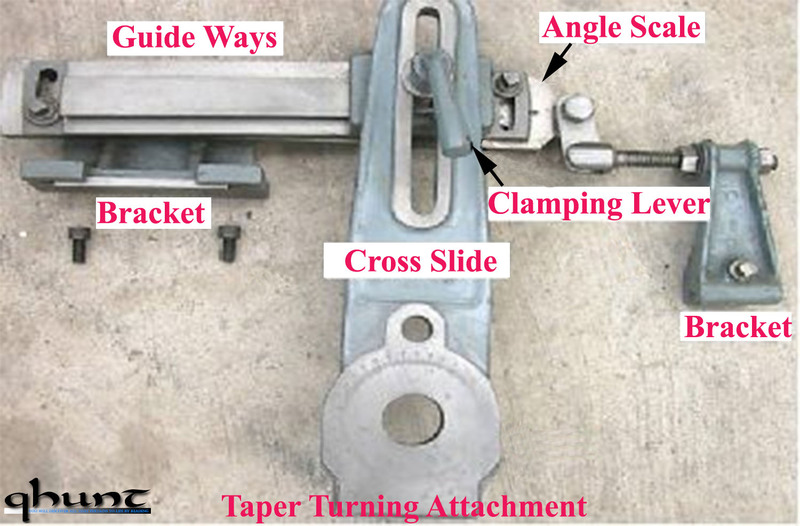 A taper turning attachment consists essentially of a bracket or frame which is attached to the rear end of the lathe bed and supports a guide bar pivoted at the centre. The bar having graduations in degrees may be swiveled on either side of the zero graduation and is set at the desired angle, with the lathe axis. When the taper turning attachment is used, the cross slide is first made free from the lead screw by removing the binder screw. The rear end of the cross slide is then tightened with the guide block by means of a bolt. 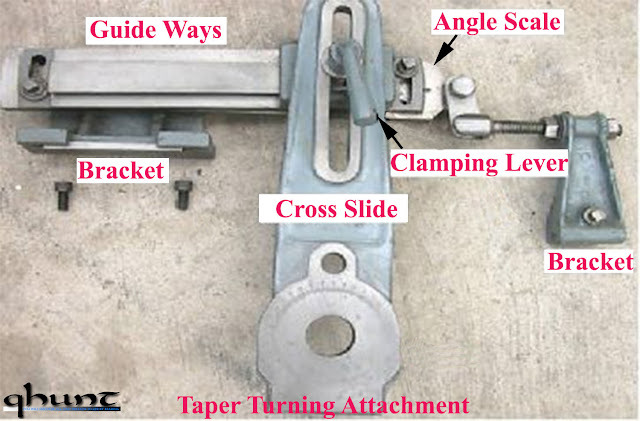 When the longitudinal feed is engaged, the tool mounted on the cross slide will follow the angular path, as the guide block will slide on the guide bar set at an angle to the lathe axis. The required depth of cut is given by the compound slide which is placed at right angles to the lathe axis. The guide bar must be set at half angle and the taper on the work must be converted in degrees. The maximum angle angle through which the guide bar may be swiveled is 100 to 120 on either side of the centre line. (a) The alignment of live and dead centres being not disturbed, both straight and taper turning may be performed on the work-piece in one setting without much loss of time. (b) Once the taper is set, any length of a piece of work may be turned taper within its limits. (c) Accurate taper on a large number of work pieces may be turned. (d) Internal tapers can be turned with ease. It is an attachment mounted on the cross slide after removing the compound rest. 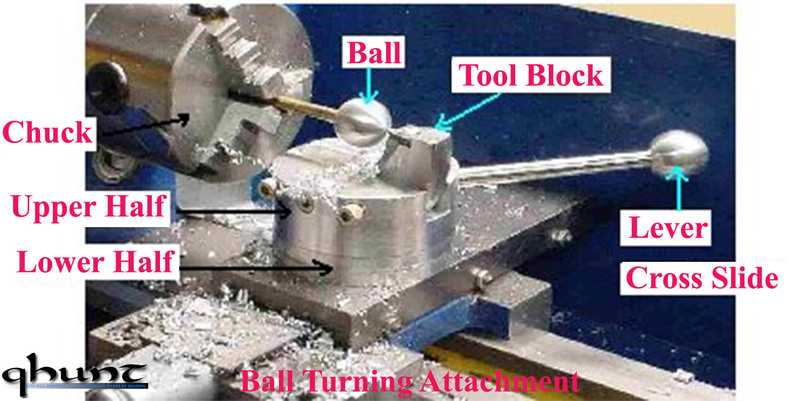 It is used for turning segment and sphere. It is in two halves, lower half and upper half. Lower half is fixed with the cross slide and upper half can be rotated with the help of a lever. There is a tool block on the top of the upper half in which provision is made to hold the tool firmly. Tool block can be moved towards the centre or away from the centre to facilitate the turning of different diameter balls. Worm wheel - The worm is in mesh with the lead screw, so that if the saddle is stationary, the lead screw acts as a worm and rotates the chasing dial. When the half nut is engaged, the tool starts travelling but the dial remains stationary with one of the graduations opposite to the arrow. When the cut is completed the saddle is returned to the starting point. When the nut is disengaged and the dial remains rotating as soon as the graduated line comes opposite to the arrow, the half nut can be engaged and the tool will follow its original cut. It refers to the turning of certain diameters at different lengths on the same shaft or jobs whose axis is not falling in line with the main axis. A crank shaft of an engine is the example of such job. 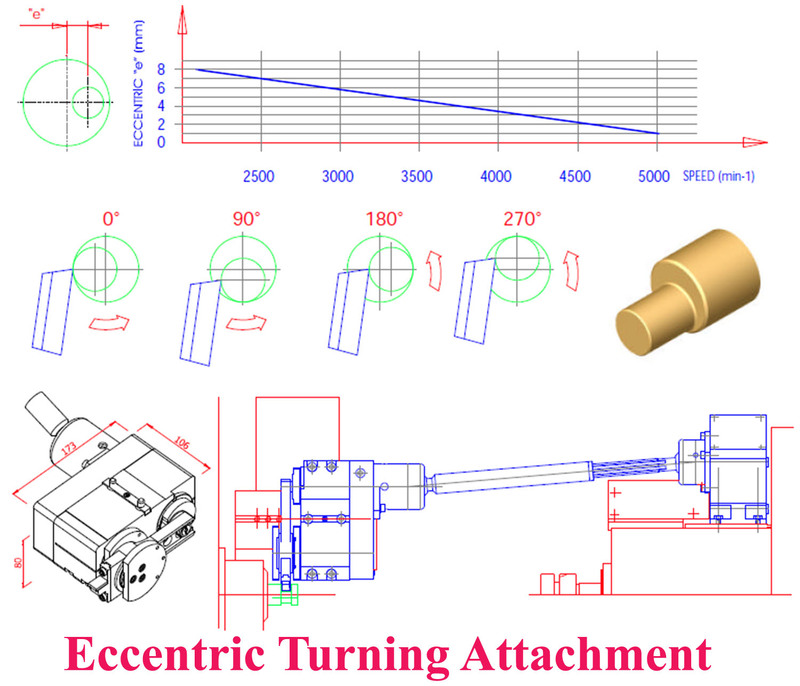 This type of attachment is equipped with the provision of shifting the centres of the work away from the lathe spindle axis. An accurate marking and truing is of prime important in the sequence of operation of jobs of this nature. It is also called tool post grinder. It is mounted on the compound rest in place of tool post. This attachment consists of a base plate, grinding wheel and a motor. The job is held in a chuck or between centres. It is extensively used for grinding lathe centres in position. 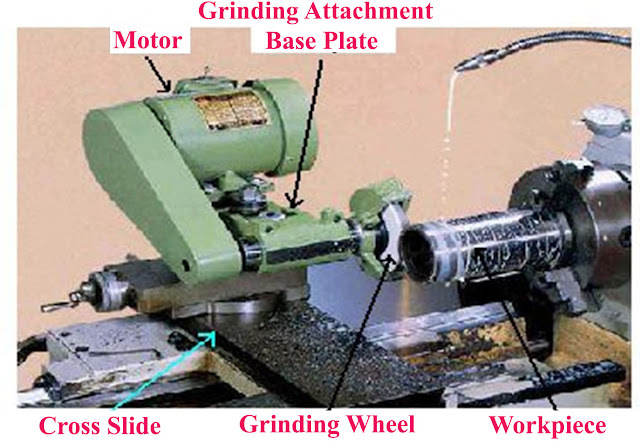 With this attachment many other grinding operations can be performed on the lathe. It is a useful attachment, which can be mounted on any lathe. It can grind hardened work and ensures a fine finish. Internal grinding can also be done with this grinder.